You already know my love of "stuff." I have great respect for those that can live with a few well chosen pieces and in some sort of functional minimalism. I can't do it. There's just too much great stuff out in the world. Luckily, I live in a very small house and I couldn't fit another thing in here. 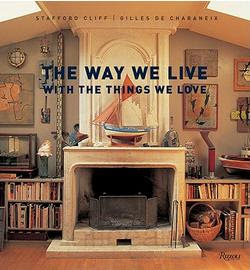 This book, "THE WAY WE LIVE with the things we love" is filled with beautiful photographs of creative and stylish interiors decorated with personalized objects and artifacts. A great read and a lavish feast for the eyes. It's from RIZZOLI and is part of their, THE WAY WE LIVE, series of books by STAFFORD CLIFF with photography by GILLES DE CHABANEIX. Check them all out and have fun being inspired. OH! I want this book. I am getting it tomorrow. Thank you for the heads up. When is your furniture line going to be available? I'm dying for 2 of the houndstooth chairs!!! I can't wait any longer. Thanks for asking. It looks like due to fabric availability and manufacturing we are running appox 30 days behind the initial launch date (First week of July). Now we are planning on launching around Aug 10th. AND another 10 (appox) different upholstered pieces with www.csn.com around the same time. Will keep you posted as details get secured. I love the houndstooth chairs. I think those are the ones that are going in my living room. They look even better in person. I will keep my eye out for this book. I have a love/hate relationship with "stuff". But I always like looking at other people's "stuff". I just bought this book. You were right. Incredible to look at and wonderful inspiration. I also love the DOMINO book you recommended. Looking forward to your furniture line & book. I have all your shows on DVR. thanks. cant wait to to take a peak into this book. i love collections!!!! At my age one must adopt the mindset of a 'functional minimalist'. If not; I have discovered your home strangely enough begins to bulge at the seams. I see that Traci has recorded all your shows. Lucky her. She could have a lucrative business, selling copies to us Canadians or would that be considered Piracy? Hmmm, maybe that is a bad idea but then again we could start an Angelo Inmates Fan Club. We would certainly have plenty of time to write you or make comments on your blog. I just (last week?) got the Domino book. it's wonderful. will take your advice on this one and add it to my list of next books to buy. thanks! p.s. i love stuff too!